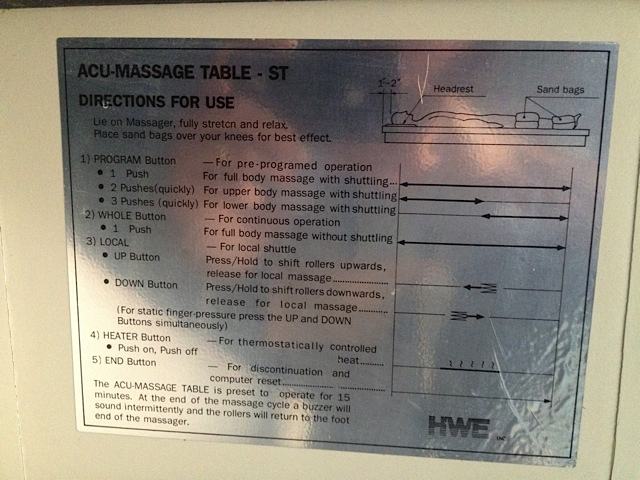 For Sale: Acu-Massage ST Table Manufactured by HWE, Inc., France Bed Co., Ltd. It is used for physical therapy, physical medicine, sports medicine, chiropractic, myopractic and shiatsu massage applications. This particular table is from a customer of ours who is a retired physician, physical therapist and former trainer for the Phoenix Suns NBA basketball team (back when the U.S. Airways Center was still America West Arena). There is a side-mounted control console, with an integrated car-stereo cassette player built in–which can be upgraded to a CD/MP3 player–as well as a hand-held controller, for operating the table. Push-button controls offer pre-programmed table operation. 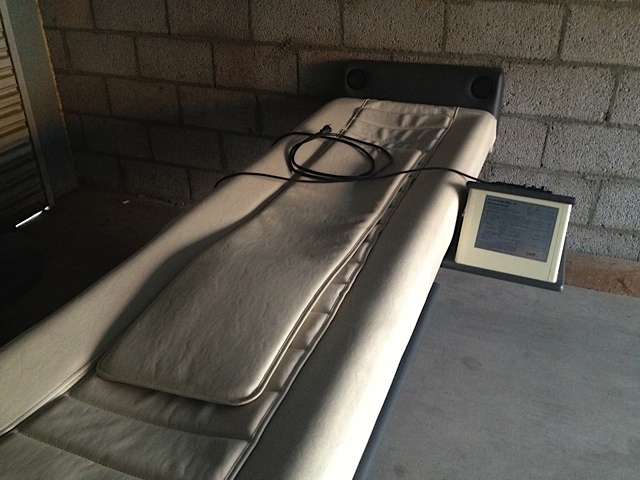 There is also a thermostatically-controlled heater for enhanced relaxation and comfort of the patient. 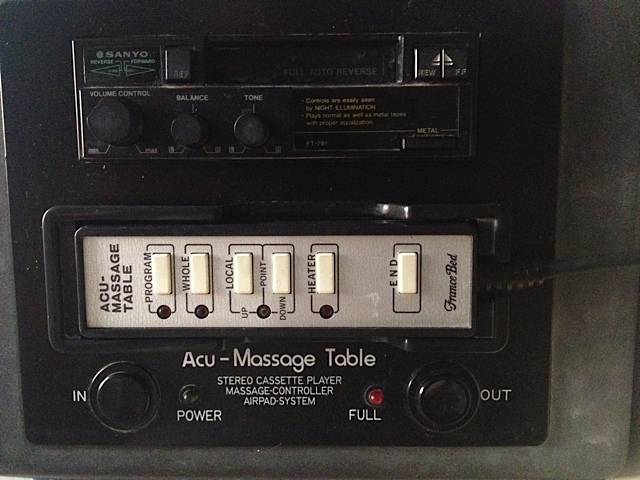 The Acu-Massage ST table is preset to operate for 15 minutes. At the end of the massage cycle, a buzzer will sound intermittently and the rollers return to the foot end of the massager. For best effect from the massager, it is recommended to use sandbags or some kind of soft-weighted material to lay across the patient’s knees and ankles during the massage. This maximizes the body-to-massager contact while it is in operation. Weight is approximately 200 lbs. 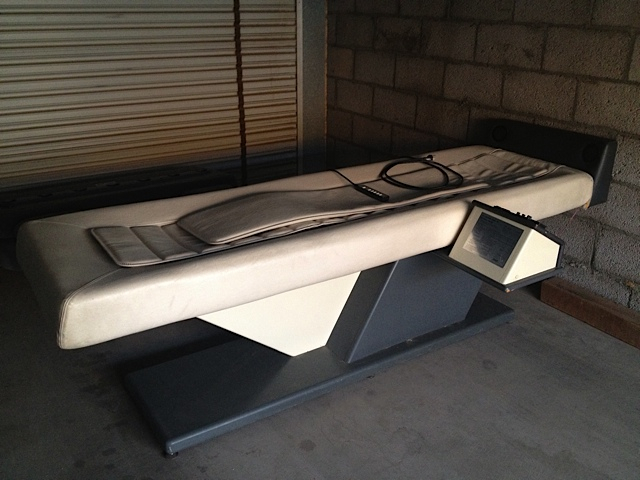 The ACU-MASSAGE ST table is being sold by Zerimar for $1700.00 (plus tax) as is, with no warranty. It comes complete with padded inlays, hand-held controller, side-mounted control console and attached head board speaker console for stereo sound system. 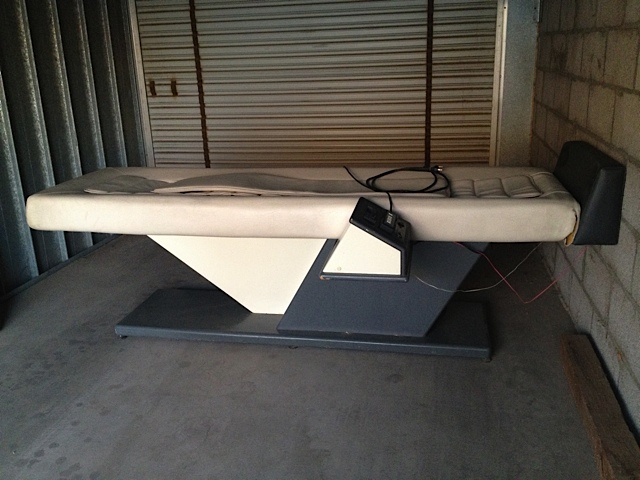 We can deliver the table to you locally (metro-Phoenix area) for a fee of $250. Or else you can pick it up directly from our north Chandler facility.